Imaging plays a critical role in the diagnostic evaluation and assessment of patients with problems at and around the Achilles tendon, both in the documentation and differential assessment of disease as well as in the staging of the extent and severity of disease present. Imaging may additionally provide important information regarding the status of the tendon and surrounding osseous and soft tissue structures following therapeutic intervention, and in some instances may provide prognostic information regarding ultimate tendon function. In this chapter, we review the normal and pathologic imaging features of the Achilles tendon, highlighting the potential utility and limitations of various imaging techniques in the non-invasive assessment of the tendon and the potential impact of imaging findings on clinical patient care. Conventional radiography is currently the mainstay of bone and joint imaging, particularly in trauma. 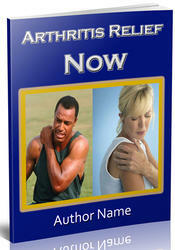 As it lacks soft tissue contrast, radiography provides limited information regarding the soft tissues. However, conventional radiography is fast, inexpensive, and readily available and may still provide important information regarding the Achilles tendon and adjacent structures.1 On lateral projection conventional radiographs, the normal margination of the Achilles tendon and adjacent pre-Achilles fat pad (Kager's triangle) is seen as a sharp soft tissue interface along the anterior (volar) margin of the tendon (Fig. 4.1).2 Rupture of the Achilles tendon, Achilles tendi-nopathy, or inflammation/hemorrhage within the pre-Achilles fat pad may obscure this sharp interface between the tendon and adjacent fat (Fig. 4.2).2 These findings may be subtle without the use of specific high-contrast (low-kilovolt) radiographic technique. Morphologically, the normal Achilles tendon should be no more than 8 mm thick in the antero-posterior (AP) dimension, being thickest proxi-mally and tapering slightly along its distal third to its insertion on the calcaneal tubercle. The normal retrocalcaneal bursa should produce a radiolu-cency anterior to the distal insertional fibers of the Achilles tendon that extends at least 2 mm below the superior surface of the calcaneus (Fig. 4.1).3 Bursitis or thickening of the tendon at its calca-neal insertion may obliterate this normal radiolu-cency on conventional radiography (Fig. 4.3). If adjacent erosions are seen to the posterior calca-neus in the region of the retrocalcaneal bursa, then an underlying inflammatory arthritis, such as rheumatoid arthritis or psoriatic arthritis, with inflammatory bursitis and pannus formation should be considered.3 Conventional radiography promptly reveals avulsive fractures, calcification, or ossification of the tendon and adjacent soft tissues. Ossification of the Achilles tendon is rare, with an ossific mass contained within the substance of the tendon, usually seen in patients prior to Achilles tendon rupture or chronic Achilles tendinopathy (Fig. 4.4).4 In contrast, ethesopathic ossification (spur formation) at the calcaneal insertion of the Achilles tendon is a fairly common finding of little clinical significance. Figure 4.2. 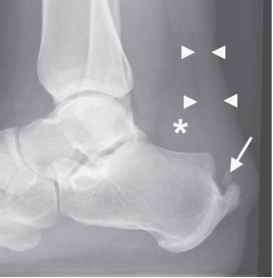 Lateral conventional radiograph of an ankle following rupture of the Achilles tendon. There is marked thickening of the Achilles tendon, loss of the normal sharp anterior border (arrowheads), and effacement of the pre-Achilles/Kager's fat pad. Figure 4.1. 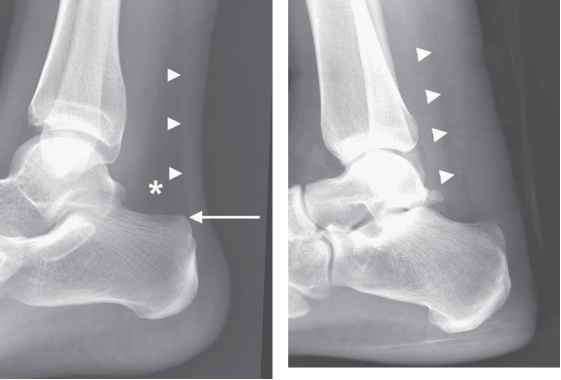 Lateral conventional radiograph of a normal ankle demonstrating a well-defined anterior margin of the Achilles tendon (arrowheads), the pre-Achilles/Kager's fat pad (*), and the retrocalcaneal bursal recess (solid arrow). Figure 4.3. Lateral conventional radiograph of an ankle showing a thickened distal Achilles tendon (arrowheads), loss of the normal retrocalcaneal bursal recess, dystrophic insertional ossification (solid arrow), and a retrocalcaneal bursitis, replacing the normal low attenuation fat pad (*). Figure 4.4. 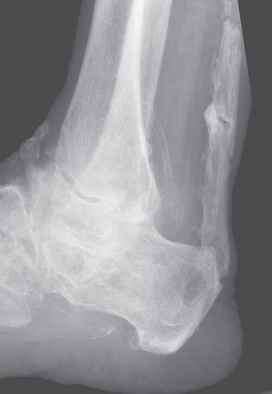 Lateral conventional radiograph showing extensive ossification of the Achilles tendon. Figure 4.5. Longitudinal ultrasound image of the Achilles tendon with Power Doppler, demonstrating increased vascularity at the musculotendinous junction. Figure 4.6. 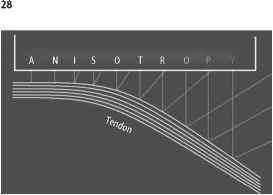 Diagrammatic representation of anisotropy. 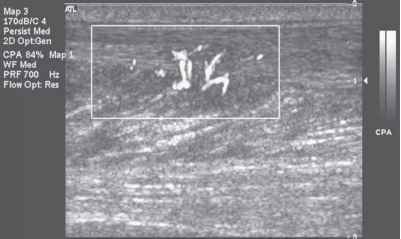 When the ultrasound beam is perpendicular to the tendon, reflected waves return to the transducer. If the tendon is off perpendicular, then the majority of the reflected waves will not be received by the transducer. ultrasonographic investigation, including dynamic real-time imaging in more than one plane, are essential to avoid this potential imaging pitfall.21 Except for its insertion on to the calcaneus, the Achilles tendon has a relatively straight course, compared with other ankle tendons, and is thus less susceptible to anisotropy at US evaluation. Nevertheless, careful examination of the Achilles, particularly at the tendon's calcaneal insertion, with cranial and caudal angulation of the probe is necessary to assess the inherent ultrastructural integrity and echogenicity of the tendon.